Our dental office in downtown Toronto uses state of the art dental technologies and unparalleled patient care to identify dental problems that ultimately affect your overall health. This method allows us to take aesthetic dentistry to the next level and become more than just your dentist but your overall wellness partner. With over 3500 hours of continued education, Dr. Cheng is your best choice for a dentist in Toronto. We use our training to educate you on your dental health so you can care for your teeth long-term. We make it our aim to accommodate to your individual needs and place you as our priority. We offer a range of comforts and conveniences, such as opening on Saturdays and downloadable patient forms. Modern technology and new techniques allow us to provide your family with breathtaking results. Experience dentistry with more accuracy and less discomfort in a calm, relaxing environment. Looking for a trustworthy dentist? Information is vital! We will provide you with the knowledge you need to make the best decision for your oral health. This is what sets us apart from other dental care providers. You are fully informed about the state of your oral health. 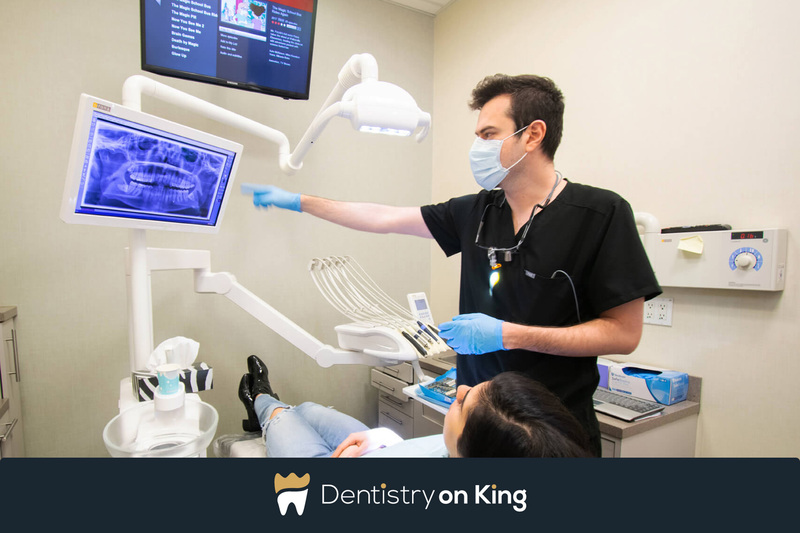 At Dentistry on King, we will never recommend treatment you don’t need. Dental excellence, genuine care, and specific training are what set our dentist in Toronto apart. ‘‘Dr. Cheng and staff provide very professional and friendly service. Our family has been going there for over 10 years and always get top-notch check-ups, cleanings, and dental advice. The staff answer all my questions with dental photos and explain things clearly. They are especially good with young children as well. Keep up the great work! What type of dental care do you need?